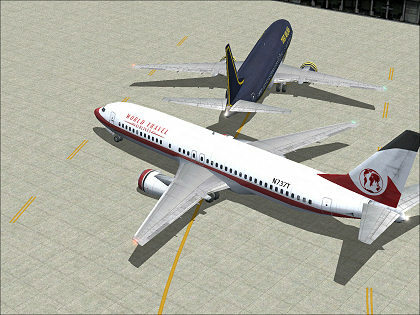 Taxiing my Boeing 737-400, number two in line. The speed readout says 26 knots, which means I'm about to have a rear-end collision. You can click on this picture to enlarge it; use your browser's "back" command to return. 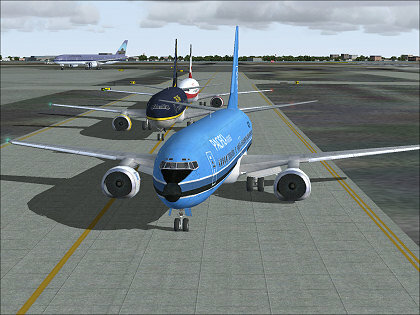 Taxiing my Boeing 737-400, number one in line (the blue airplane). The airplane is at an odd angle because I just cut in front of the other two airplanes (the dark and white airplanes). I had been behind the other airplanes, but I gunned the engines, pulled out on to the grass to pass them, then turned back on to the tarmac and jammed on the brakes. Once the autogenerated airplanes snugged up behind me, I snapped the picture. You can click on this picture to enlarge it; use your browser's "back" command to return. 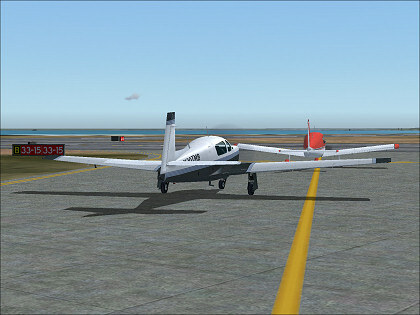 I'm controlling the white airplane in the foreground; the other airplane is autogenerated. I parked my airplane directly behind the autogenerated airplane, and when the autogenerated airplane tried to back up to depart, it was stuck and couldn't move. Ha, ha. Here's a scene that has to be simulated, because you'll never see it in real life. 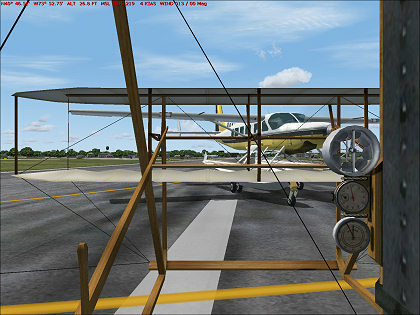 I was flying the Wright Flyer in the foreground, and landed on the runway just when an autogenerated Cessna Caravan Amphibian landed from the opposite direction. There was enough room for the Cessna to land, and as it turned off on to a taxiway, I snapped the picture. 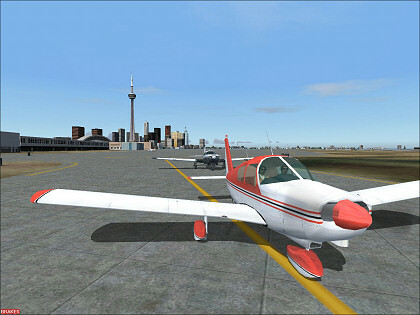 I'm flying the Mooney Bravo, number two for departure out of Toronto City Centre airport. By the way, when you see multiple airplanes in a picture, only your airplane has tail numbers, the autogenerated planes don't have any. You can click on the right-hand picture to enlarge it; use your browser's "back" command to return.